Drake University received a B.
Washington Monthly's ranking of 200 out of 224 of Affordable Elite Colleges - Overall Rank was a major contributor to this grade. 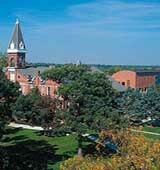 Drake University in Des Moines - the capital and largest city in Iowa - is a full-service private institution, with undergraduate programs in the liberal arts, journalism, business, and more. About 98% of Drake's students receive financial aid, and the school offers over 5,000 scholarships and $70 million in financial assistance. Describe the type of student who should not attend Drake University and explain why. A student who wants a big university with many students and hundreds of clubs because Drake does not offer that. What is a typical Drake University student like? Describe the type of person that should attend Drake University. What are the top 3 reasons someone should attend Drake University? Someone should attend Drake if they want to get involved, continuously learn throughout all four years, and be in a city that is thriving and named one of the tip cities for young professionals. What was a typical Drake University student like in high school? Describe the type of person that should attend Drake University. Drake students were typically at the top of their class in high school and were involved in many extracurriculars. Anyone who is willing to get involved on campus should attend Drake University. Drake University is a private, fully accredited, coeducational university on a 120-acre campus in Des Moines, Iowa. We're consistently recognized as one of the very best universities in the Midwest for academic excellence, and we pride ourselves on providing our students with valuable opportunities for success. Our mid-sized campus community allows faculty and staff to foster close relationships with students and help them meet educational, professional and personal goals. More than 3,500 undergraduate students choose from among 70 programs of study, combine majors or create their own major. We enroll more than 2,100 graduate students and offer more than 20 graduate-level degrees. Drake students engage a multitude of learning opportunities in Des Moines through partnerships with a bounty of businesses, schools, government and cultural activities. Jobs and internships prepare our students for success in their personal and professional lives. In short, Drake helps make dreams come true. What are the top 3 things that students do for fun at Drake University? 75% of students graduated in the top quarter of their class. 42% of students graduated in the top tenth of their class. The average student pays $26,330 for tuition, fees, and other expenses, after grants and scholarships. Total stated tuition is $30,743, in-state and on-campus, before financial aid. Learn more about financial aid at http://www.drake.edu/advantage/costs-finaid/scholar-finaid.php. Estimate the net price for you at http://www.drake.edu/advantage/costs-finaid/financial-aid/earlyestimate_fresh.php. 52% of students graduated on time. The typical (median) early career salary of Drake University graduates is $41,600, according to Payscale. Drake University participates in the NCAA Division I-AA for college athletics. Want more info about Drake University? Get free advice from education experts and Noodle community members.